I finally got a chance to break out this coat! It was perfect for a day like today.. crisp and cool with lots of sun! I couldn't decide on a bag option though. I love the pop of blue but the shearling is just oh-so-cute and more daytime so I decided to shoot both anyway. It's a great day to night switch actually. I also couldn't believe the price tag on the leggings and I was even more surprised that the fit was there. They look exactly like a pair of Balmain ones that sell for like a ridiculous amount (try over 5k!). The only thing I could find relatively affordable for suede leggings are here. In fact, most of the items I'm wearing today are really, really good deals. The coat was one of my favorite finds at TJ Maxx this fall. There is just something about the shape and attention to detail, and it's also super soft and comfy. I hate a coat that I can't move in! Which bag do you like best with this look? 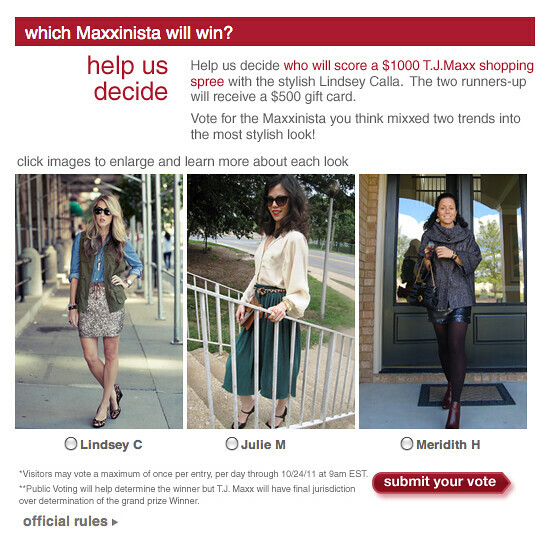 Also, don't forget to cast your vote on who should win a $1,000 TJ Maxx shopping spree with me in NY! They all did such an amazing job... Who is your fave?